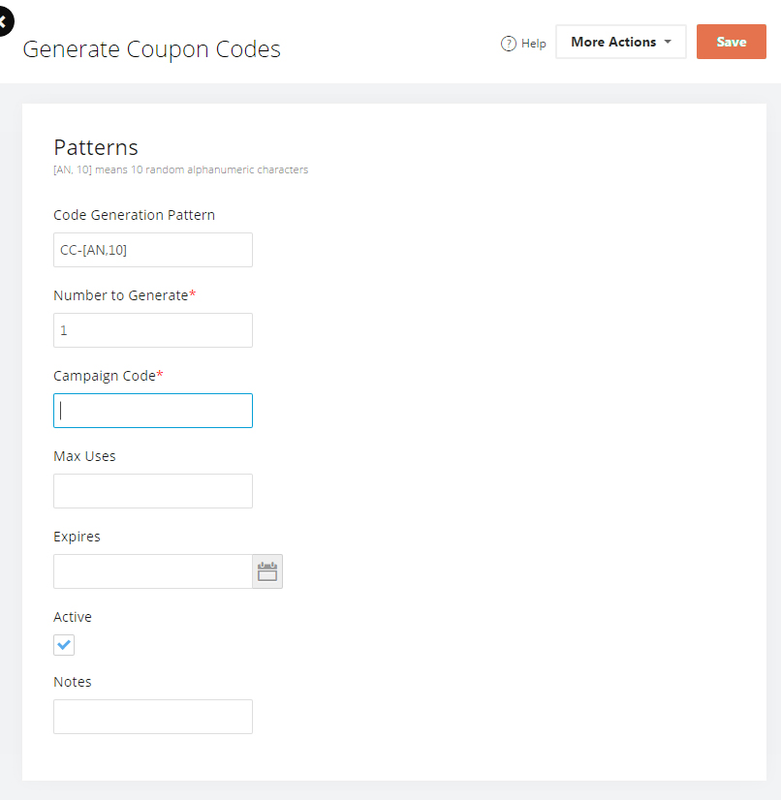 You can create a large amount of random coupon codes by using the Campaign Coupon Codes feature. The discount system can support any number of coupon codes with one discount method. Combining these features provide a useful tool for marketing campaigns. To create the coupons, go to Marketing > Power Features> Campaign Coupons. The new coupons are useless without their accompanying discount setup. Now all the Coupon Codes for that Campaign will trigger the discount method. You can also couple this new rule with any of the existing rules and actions to create many different types of coupon discounts. Is there a merge code generated for the series of campaign codes, which I can place in an email template, such that each time an email is sent using the template, the next successive merge code from the series is used? In other words, how can the series of campaign codes be used practically? Searching the site hasn't turned up any info on this. The email merge is a great feature extension, could you slap that in our http://vote.americommerce.com feature voting queue so we will capture it for inspection for each release of the software? We pull from that list all the time when planning releases. Great idea and it will allow this feature to be used more efficiently in mass mailings! Hi Agnes - would love to see what you are doing with your site. Sounds like you're really making A/C sing :-) Can you share your site url. Or we can do it by email? What about the possibility of offering two discounts on the same coupon (free shipping + 10% off)? Each discount rule that you create can only have one action, but you can create multiple that use the same coupon code. So if you create one discount rule that gives free shipping for entering the coupon code and and create another that gives 10% off for entering the same coupon code, when the user enters that coupon code, it will trigger both actions. Per my conversation with Brandi Lovett in the KnowledgeCenter (I opened a ticket when I tried Shayne's method couldn't get it to work) that we cannot assign two different campaign codes to the same coupon code, the response was "You can not use one coupon code for 2 different discount methods. It will not function correctly. These will have to be set up as two different codes." So is this not possible to have two different actions (free shipping + 10% off) tied to a single coupon code?